It is difficult to have a true connection to athletes who we did not see play in person or on TV. We watch sports because we support our favorite teams, but also because only the greatest of all athletes create these special moments that become ingrained in our minds forever. All I have are stories and some very blurry video of Babe Ruth’s “Called Shot” in the 1932 World Series against the Chicago Cubs or Franco Harris’ Immaculate Reception against the Oakland Raiders in 1972. However, I have vivid memories and deep emotions that come from seeing Michael Phelps win eight gold medals in the 2008 Beijing Olympics, Michael Jordan’s “Final Shot” against the Utah Jazz in Game 6 of the 1998 NBA Finals and Mike Piazza’s 2-run home run to give the Mets a 3-2 lead in the bottom of the eight inning on September 21, 2001, the first game played in New York after the 9/11 attacks. I will never forget how those athletes made me feel so alive during those special moments. It is the rare athlete though, who can spark such strong emotions from those who did not see him or her create those special times. I was not alive to see Len Bias play. All I have are people’s stories, some old articles and a few YouTube clips to give me an idea of the magnitude of the person and basketball star Bias was. But as a student at the University of Maryland, I felt his presence and the impact he had on my school from the moment I decided to send in my deposit. A lot of people know Bias was a great basketball player. He twice led the ACC in scoring, finishing his collegiate career as Maryland’s alltime leading scorer with a total of 2,149 points (he is now third behind Juan Dixon and Greivis Vasquez). The well-rounded, 6-foot-8-inch forward was a two-time All-American and is also one just eight players in ACC history to be named ACC Player of the Year twice. Only two Maryland basketball players, John Lucas in 1976 and Joe Smith in 1995, have been picked higher than Bias in the NBA draft. 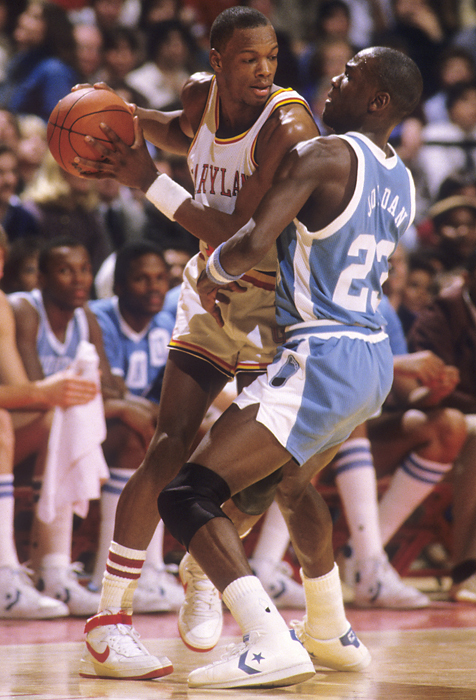 However, it is plays like this one that spark the same emotion from its viewers now than it did on February 21, 1986, a date on which Bias had 35 points to lead the Terps to a 77-72 overtime victory over then-No. 1 North Carolina. Plays like that inspire the kind of wonder and awe at how a player as big and strong as Bias had such a pure jump shot, speed and agility. Whenever I watch that highlight, I understand what Bias meant to Maryland fans during that time. I can feel the pride Terp fans had, to have a player of Bias’ caliber on their side instead of playing in the different shades of blue of Maryland’s most hated enemies. I can feel the sense of hope, the feeling that the Terps had finally found the light at the end of the tunnel, and that they were emerging out of Duke and North Carolina’s shadow. I can feel the joy that people must have had seeing the versatility in Bias’ game, seeing how he could beat his opponents in so many different ways and how he displayed so much passion in the process. Bias was so good in fact, that in 2003, Duke coach Mike Krzyzewski told Bob Ryan of the Boston Globe that Bias and Michael Jordan were the two most influential players during his time at Duke. 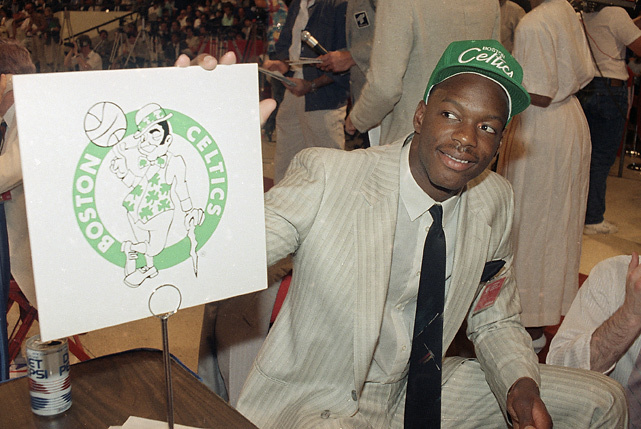 There is no doubt that Len Bias was a special player, and seemingly headed to the perfect situation to play besides Larry Bird, Danny Ainge, Kevin McHale, Bill Walton and Robert Parish with the Boston Celtics. There is just no telling how great he would have become. But Bias has probably touched more lives with the way his story unfolded than he would have had he enjoyed a Hall of Fame NBA career. The numbers are impossible to count, but there are so many people who either stopped or never started using drugs because the dangers of drugs became clear at the moment Bias passed away. If drugs could kill big, healthy, strong Len Bias, they could kill anyone. These numbers are only enhanced by Bias’ mother, Lonise Bias, who became a motivational speaker after her son’s death. She has told her son’s story to thousands of kids, stressing the importance of making good decisions and how even abusing drugs one time can be fatal. Len Bias’ story sends chills down my spine every single time. It is a true tragedy. He had everything he had ever desired, the chance to play in the NBA, right in his back pocket and he threw it away with one bad decision. He died on June 19, 1986, 25 years ago yesterday, yet the moments he created first because of his play, and then because of his downfall are ones that still bring out strong emotions in people. Bias is that rare athlete that multiple generations can connect to, even if they did not see him play. The amount of lives Bias has touched throughout the world cannot be counted, but his story shows us just how quickly everything can be taken away, just how precious life is. It is powerful and people have been, and will continue to feel the pain of Bias’ tragedy and what might have been forever. This entry was posted on June 20, 2011 by Scott Kornberg. 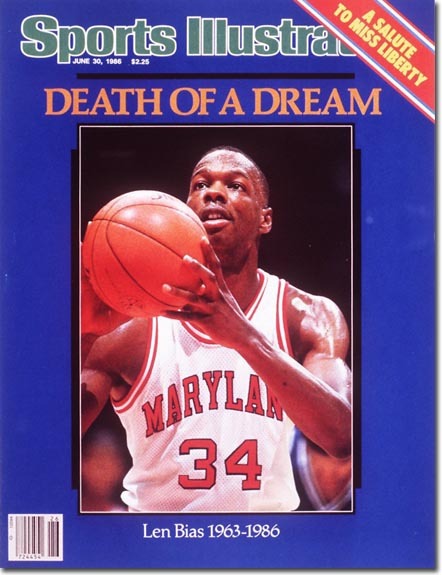 It was filed under Len Bias, Maryland Terrapins and was tagged with Bias, Cole Field House, Lefty Driesell, Len Bias, Maryland, Maryland Terps, Maryland Terrapins, Scott Kornberg, Terps.